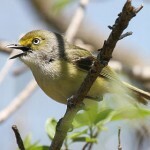 Song is hoarse, and similar to Cassin’s and Yellow-throated Vireo’s. Description: Sexes similar. Dark gray above; pale gray below, with never more than a hint of yellow on sides; bold white spectacles; two bold white wing bars. Habitat: Found in ponderosa pine forests, or in transitional zone between pines and deciduous trees near water courses in canyon bottoms. 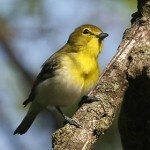 Where in Nebraska: Uncommon spring and fall migrant in western Nebraska. Rare summer resident and breeder in the Pine Ridge area, especially Sioux County. 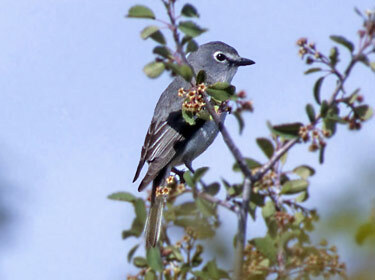 Fun Facts: The Plumbeous Vireo was first by an ornithologist named Elliott Coues in 1866. 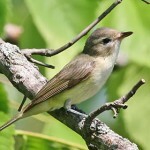 Additional Information: Once lumped together with Blue-headed and Cassin’s Vireos into one species, the Solitary Vireo.